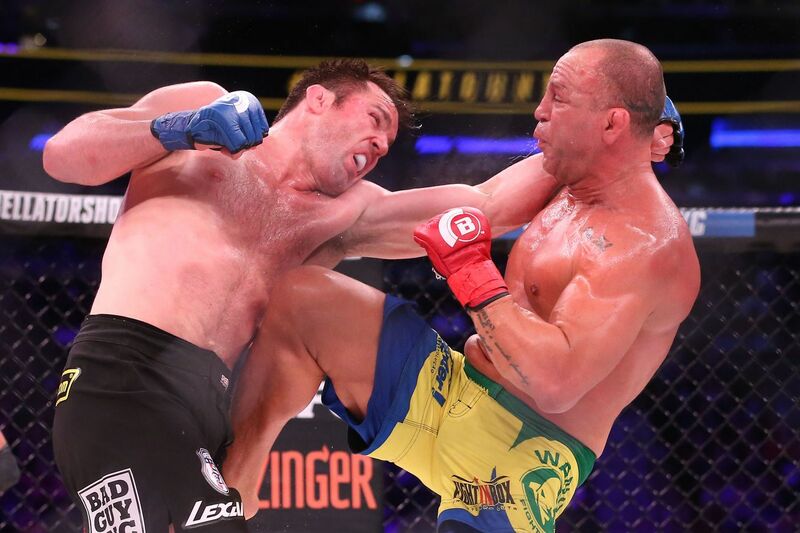 Things didn’t quite go Wanderlei Silva’s way during Saturday’s Bellator pay-per-view from New York City, with “The Axe Murderer” dropping a unanimous decision loss to his longtime nemesis Chael Sonnen. Sonnen took advantage of his wrestling edge to keep Silva on the mat and off his feet, which was a smart move by Chael considering the flashes of violence Wanderlei proved he could still unleash with his fists. Wanderlei’s coach Andre Dida also sent MMA Fighting a thoughtful statement breaking down the results. We trained hard for five months based on Sonnen’s game, takedowns and working on top, scoring points and holding on until it’s over to guarantee the rounds, and that’s the fight we expected from him. We had a strategy for that, with sprawl, knees, takedown defense, head kick, front kick, distance… We worked on everything we had to. The camp was based on Sonnen going for the takedown against Wanderlei like he always fights, and he wouldn’t do anything different this time. Unfortunately, we couldn’t impose our strategy, and (Sonnen) did. That’s MMA, whoever gets first, takes it. When Wanderlei was able to use his striking, he knocked Sonnen down, came close to winning twice, with the guillotine and the knockdown. He rocked him twice. Wanderlei has great power in his hands. I’m upset and happy at the same time. I’m upset with the loss, but happy because Wanderlei is back, back to fight rhythm, and that’s important. He haven’t fought in four years, that’s not easy. When you’re away for so long it plays against you, athletes know when I’m talking about. We trained hard to compensate that. I’m seeing people on social media asking why Wanderlei didn’t get back up. It’s not like that. Sonnen is good in this area. He does that well. It’s not that simple to go for an armbar or triangle, foot to the hip to sweep or get back up with someone punching you in the face, especially someone that knows what he has to do to keep you there. Unfortunately, Sonnen’s merits, he fought his fight. That’s his kind of fight, and Wanderlei almost finished him twice. I’m sure that this fight demanded a lot from Wanderlei in terms of head, cardio and strength. He survived on the ground, he wasn’t submitted. On to the next one now. Let’s see who’s the next opponent. Everybody learns, every fight teaches you something new. You have to evolve. Wanderlei has a lot of fire in him, there are great opponents for him to face and put on great fights for the fans. Next time we’ll go for the knockout to give fans this present. It’s easy to forget that Wanderlei has been stuck outside the cage for years following the Nevada State Athletic Commission’s attempt to give him a lifetime ban from the sport. That’s a lot of time for an athlete to lose, especially one on the older spectrum like Silva. Hopefully he’ll have a few more of the kinks worked out for whatever wonderful freakshow of a fight Bellator lines up for him next … maybe somebody with a bit less of a wrestling pedigree? For violence’s sake?